The ToughBuilt Tape Measure / Utility Knife Pouch transforms how professionals carry their tape measure and knife. The patented ClipTech Hub allows this pouch to clip on and off any belt. Works great alone, or combined with any ClipTech tool belt. This pouch includes a ToughBuilt notebook, carpenter pencil and carabiner. Its 7 pockets and loops include the adjustable tape measure pocket, plastic-lined knife pocket, and screwdriver loops. With rugged construction and heavy-duty rivet reinforcement this reliable pouch withstands the most rigorous working conditions. ULTIMATE POWER AND INNOVATIVE SOLUTIONS. Quality tools and accessories that professionals depend on. Built tough to handle your most challenging tasks. Solid performance that makes short work of all your projects. Innovative products since 1924. 11 Electrical/Maintenance Tool Carrier with Parts Tray. 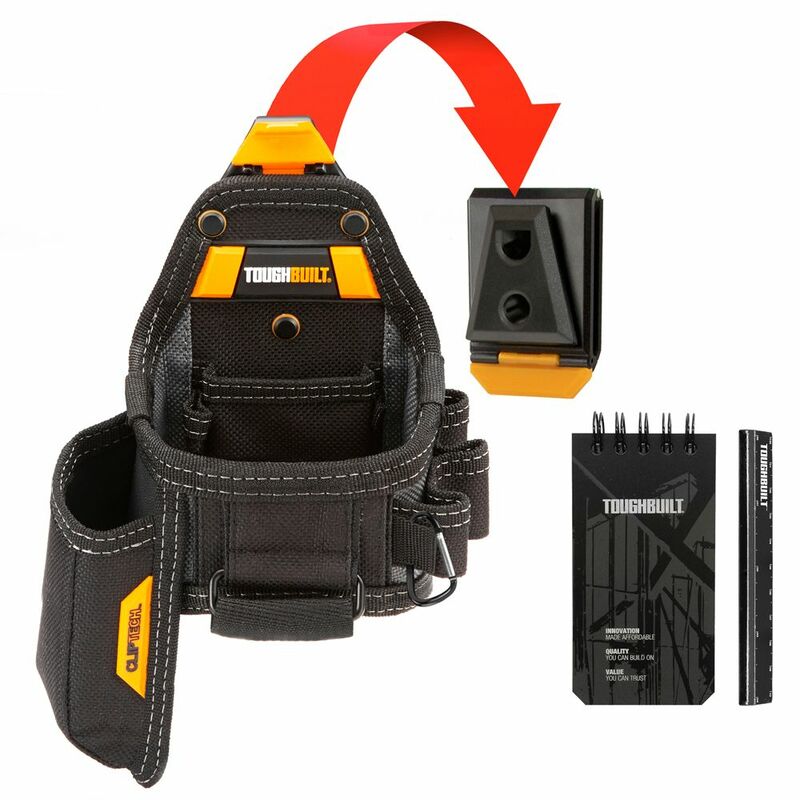 Dewalt's dual compartment 57 pocket LED lighted tool storage backpack features an integrated 3 level LED light that swivels, 2 straps for cordless drill/driver and battery charger, carrying handles, padded shoulders with sternum strap and back padding. The ToughBuilt 8 inch Tote is an ideal tool tote for DIYers and service professionals alike. Its 23 pockets include structured external pockets that flex to securely hold tools in place and internal dividers to keep everything organized. It features a quick release handle for superior visibility and accessibility. Made with high-quality rugged materials, heavy-duty rivet reinforcement and high-impact clawed rubber feet this hard-working combo keeps up with the most rigorous demands. Tape Measure / Utility Knife Pouch + Notebook & Pencil The ToughBuilt Tape Measure / Utility Knife Pouch transforms how professionals carry their tape measure and knife. The patented ClipTech Hub allows this pouch to clip on and off any belt. Works great alone, or combined with any ClipTech tool belt. This pouch includes a ToughBuilt notebook, carpenter pencil and carabiner. Its 7 pockets and loops include the adjustable tape measure pocket, plastic-lined knife pocket, and screwdriver loops. With rugged construction and heavy-duty rivet reinforcement this reliable pouch withstands the most rigorous working conditions. Tape Measure / Utility Knife Pouch + Notebook & Pencil is rated 3.8 out of 5 by 12. Rated 3 out of 5 by Irrelivanti from Great, but... I understood there was a velcro strap to tighten/loosen the pouch on the bottom. Didn't realize it was an open bottom pouch, minus the velcro strap. I bought it to store 18 gauge nails, and other smaller items, but can't because of the open bottom. More pictures would've helped me pick another pouch. Wanted to like it, but it was way too tight, even without the notepad, for my 25' Milwaukee tape to be of real use for me. Just purchased the tradesman tool belt from these guys and it's phenomenal, but can't really use this for it's original purpose, or what I wanted to use it for.